Last year I was able to snag a great deal on composition notebooks, getting them for less than 10¢ a piece. 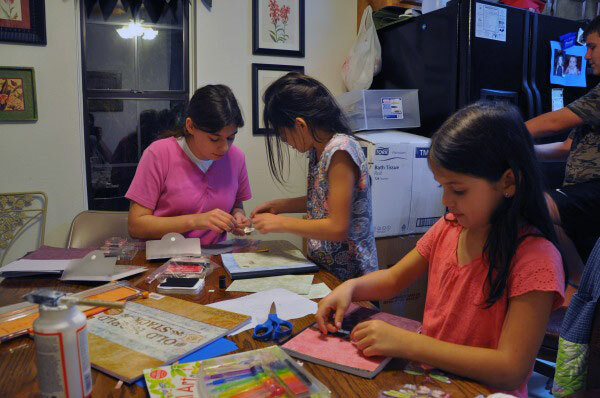 My girls and I decided to spruce some of them up with scrapbooking paper, creating our own personalized journals. My girls use the journals for handwriting/dictation practice, church notes, prayer journals, or gifts to others. We usually spend a couple of hours decorating and chatting. 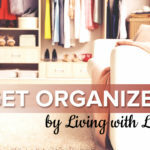 It is a wonderful way to build relationships in the family while creating beautiful items for the home. 1. 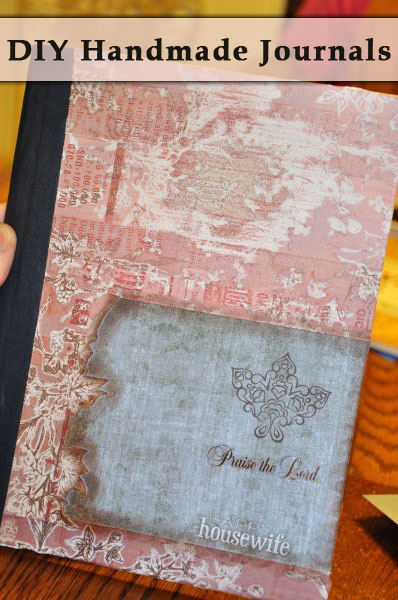 Choose your paper combination and glue it onto the notebook using Mod Podge and a sponge brush. On the front of each notebook, the binding is covered in a black material. Line up the paper right where the black material ends. Leave a one inch overhang on the other three sides. I usually choose two contrasting papers. I will sometimes put one on the top half and one on the bottom half of the notebook. Today I modified this technique and added another strip to the bottom that matched the top. 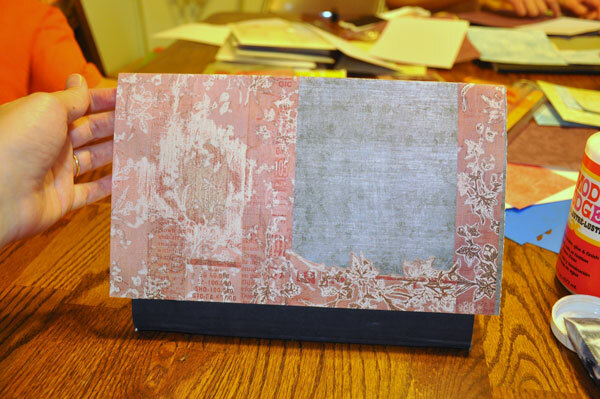 I then cut out a motif from the paper and placed it down the side of the grey paper. 2. 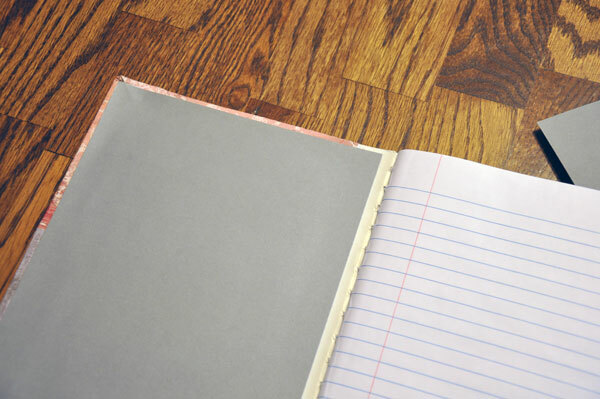 Fold the excess paper toward the inside of the notebook, starting with the length of the notebook. Carefully fold over the corners. This sometimes takes several small folds. Then fold down the top and the bottom edges. With the sponge brush, sponge Mod Podge under the folds to hold them down. 3. Cut out a piece of paper the size of the inside of the notebook. 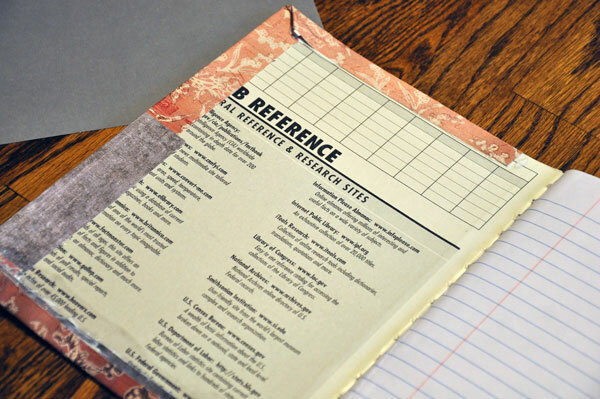 Glue this down over the folded sides to cover them up and give a more finished look to the notebook. 4. Repeat the above steps for the back side of the notebook. 5. Get creative and add the embellishments! I used a stamp and some smudged ink around the edges of the motif. 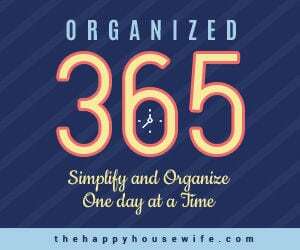 You could also add ribbon, buttons, stickers, glitter, or any other fun embellishment you have on hand.